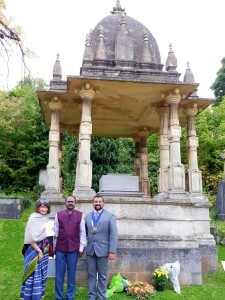 People from various parts of Great Britain, India and elsewhere gathered in Bristol to pay homage to commemorate the life and legacy of the 19th-century Indian social reformer and scholar Raja Ram Mohan Roy, who visited England and died of meningitis in Bristol on September 27, 1833. Commemorations started at Roy’s tomb at 12 pm on Sunday. Hymns and songs composed by Roy were sung by members of the Brahma Samaj at the service. Tributes were paid by many admirers far and near including the civic officials, diplomats, Brahmo Samaj faithful, the Unitarians, and the Arnos Vale trustees. Flowers and wreaths were placed at the tomb by the dignitaries and the congregation. Lord Mayor of Bristol Cllr Lesley Alexander, who attended the event in civic regalia, welcomed all to the service and recalled Roy’s association with the leading English educator at that time in Bristol, Lant Carpenter and his daughter Mary Carpenter, who later spearheaded anti-slavery movement and women suffrage in Great Britain. Cllr Alexander said the city cherished its links with Roy, whose life-size statue has been installed at the city centre in front of the City Hall. Bristol also has a walk named after Roy as well as a large portrait painted during his visit here. After the ceremony, various aspects of Roy’s life and work in India and during his stay in England were presented in the adjoining chapel. Dr Sumit Chanda, the leader of the London Brahmo Samaj spoke on the evolution of Rajah from a curious student to the role of an ambassador and a social reformer. Historian Carla Contractor presented the connections of Raja Ram Mohan Roy with Bristol and elucidated Rajah’s last days. Ms Contractor spoke about Rajah’s convictions as a moral philosopher, his determination to remain to stay close to Mother Earth even on his deathbed, the perplexity amongst his friends after his death on how to conduct his burial and the unusual silent interment that happened in 1833 according to Rajah’s will. Bristol Museum’s former curator Peter Hardy spoke about the sesquicentenary Bristol exhibition on the Rajah. The Unitarians and Brahma Samaj led the prayer service and blessings. Bristol Bradley Stoke Deputy Mayor Cllr Tom Aditya proposed the vote of thanks to all those who attended the event and said that he is also a proud member of the Indian diaspora community in the UK. 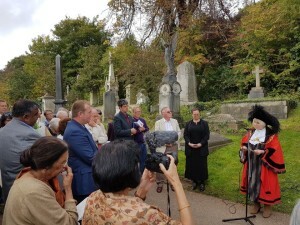 He made special thanks to Carla Contractor and her team, who has worked over the years to preserve Roy’s legacy in Bristol as well as to Minister AS Rajan, who represented the Indian High Commission at the commemoration service. 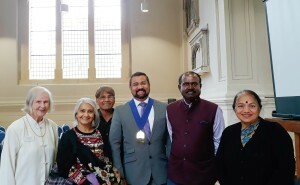 Cllr Aditya, who is also a Trustee of the Multi-Faith Forum, hailed Ram Mohan Roy as the prime radiating example of the multi-faith stream and regarded Raja Ram Mohan Roy as the “Maker of Modern India” and added that his legacy will continue to inspire generations to come.